AMP Robotics and Ryohshin partner to launch groundbreaking AI-driven robotics systems for construction and demolition (C&D) recycling. DENVER & TOKYO--(BUSINESS WIRE)--AMP Robotics Corp. (“AMP”), a pioneer in artificial intelligence (“AI”) and robotics for the recycling industry, and Ryohshin Co. Ltd. (“Ryohshin”), a leader in waste management technology in Japan, today announced a partnership to make and sell AI-driven industrial robotics for material recovery in the Japanese Construction and Demolition (“C&D”) market. The companies also announced the commercial launch of a comprehensive solution of high-performance C&D robotic systems now available in Japan. Ryohshin and AMP co-developed a groundbreaking robotic system using the AMP Neuron™ AI platform to guide high-performance robots that recognize, sort, pick and process C&D debris for recycling. The two C&D robotic systems are called ‘AI-Benkei’ and ‘AI-Musashi’. AI-Benkei is the heavy-duty workhorse using a single-robot cell to handle heavy debris up to 40 kg, processing up to a remarkable 25 metric tons per hour. AI-Musashi is the highspeed racehorse using a tandem-robot cell that rapidly picks smaller items at an unprecedented speed of 160 pieces of material per minute, processing up to 10 metric tons per hour. The two systems combine payload and speed to form a complete solution that can operate 24/7 and process a vast array of material including metal, wood, electronics, concrete and much more. AMP has licensed AMP Neuron to Ryohshin for their use and sale of these robotic systems in Japan. In return, AMP will use the robotic technology developed with Ryohshin for its own next generation AMP Cortex™ C&D robotic system for sale in North America. AMP Neuron is the “eyes” and “brain” of the robotic system achieving real-time pattern recognition to identify target materials. It continuously learns by processing vast amounts of data converted from millions of images captured via its vision system. AMP Neuron recognizes different colors, textures, shapes and patterns to identify material characteristics. AMP Neuron collects all data in a material stream, providing transparency about its material composition, as well as analysis of operational productivity. Customers use this data to monitor and measure performance, while gaining critical insights to make key business decisions. Ryohshin will show AI-Benkei and AI-Musashi at the 2019 N-Expo, Asia’s largest environmental trade show taking place in Tokyo March 12 - 15, 2019. AMP Robotics™ is transforming the economics of recycling using advanced artificial intelligence (AI) and robotics. The company’s high-performance industrial robotics system, AMP Cortex™, precisely automates the identification, sorting and processing of material streams to extract maximum value for businesses that recycle municipal solid waste, e-waste and construction and demolition. The AMP Neuron™ AI platform operates AMP Cortex using advanced computer vision and machine learning to continuously train itself by processing millions of material images within an ever-expanding neural network that experientially adapts to changes in a facility’s material stream. Visit us at www.amprobotics.com. 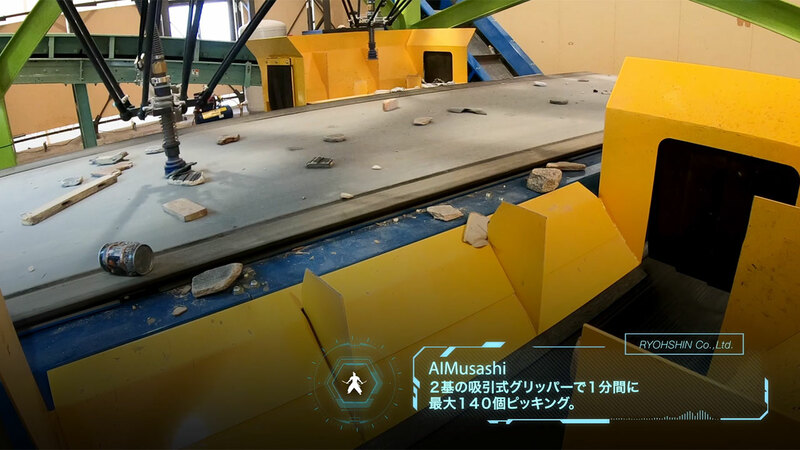 AMP Robotics and Ryohshin partner to launch new artificial intelligence and robotics system for construction and demolition recycling in Japan.